Summary: Once again this lighting specialist has issued a very satisfactory set of results. The highlight was the performance of the group’s main division, which following a few subdued years has suddenly enjoyed a step-change to its financial progress. TFW’s other divisions reported impressive numbers, too, while the balance sheet remains teeming with surplus cash and investments. Throw in a coded management ‘upgrade’ for the full year and it’s perhaps no surprise the shares presently trade on an extended rating. I continue to hold. November’s positive AGM statement had already suggested these first-half results could be very satisfactory. In the event, revenue advanced 24% while operating profit gained 20%. The headline numbers were the first for 18 months that did not require any adjusting for a Dutch acquisition completed in April 2015. TFW’s statement was somewhat unusual in light of the present economic climate, as there was no mention of currency movements. Some 28% of last year’s revenue was produced overseas and I wonder whether the weaker GBP helped bolster these figures. The chairman’s statement referred to an “exceptionally buoyant” first half at Thorlux, the group’s largest division. I suspect Thorlux’s performance was supported by the division gaining extra income from not only manufacturing lights, but starting to install them for customers as well. At least that was the impression given within TFW’s 2016 annual report. Either way, what is clear is that there has been a sudden step-change within Thorlux’s financial progress. TFW’s statement admitted Thorlux’s H1 profitability had been hampered by greater levels of staff overtime to “satisfy the spikes in customer demand”. However, the group admitted “it [was] unlikely… such levels of activity will persist”, which I guess means Thorlux’s second half may not be as productive. Anyway, despite the overtime, Thorlux’s H1 margin was still a robust 19% to support the wider 15% group margin. The performance of TFW’s Dutch acquisition, Lightronics, continues to impress. Following a tremendous 2016 performance, this H1 witnessed Lightronics revenue climb a further 38% to £9.7m and profit jump another 57% to £1.1m. “One off projects” were said to have helped the Dutch operation. 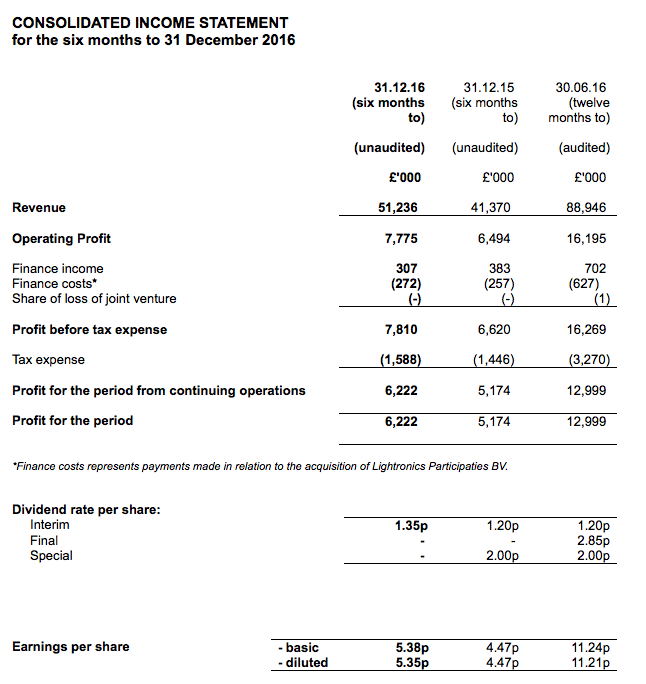 (I note the sum TFW owes to Lightronics’ former owners as an ‘earn-out’ has increased once again and now stands at £4.8m). Meanwhile, TFW’s handful of smaller UK divisions collectively put in another strong effort. Revenue here climbed 34% to £10.0m and took operating profit 45% higher to £0.6m. I could find nothing untoward within TFW’s cash flow statement. Favourable working-capital movements were counterbalanced by modestly higher capex, and an extra £2m was added to the group’s bank balance. I calculate TFW’s cash and investments now stand at £39m, with various other ‘surplus’ financial assets and the Lightronics earn-out liability taking the overall financial position to £41m (or 36p per share). I am pleased TFW’s final-salary pension scheme continues to show a surplus. Operating profit for the year ending December 2016 was £17.4m and, after applying tax at the 20% seen in this H1 statement, earnings come to about £14.0m or 12.1p per share. Adjusting the present £370m market cap (at 320p) for the group’s net cash, investments and the Lightronics earn-out, I come to an enterprise value (EV) of £329m or 284p per share. Dividing that 284p per share EV figure by my 12.1p earnings guess gives me a trailing P/E of 23. With Thorlux and the ‘Other’ UK operations now joining Lightronics to boast impressive double-digit growth, I suppose it is no surprise the multiple has since extended to 23. But just how long TFW can sustain the 20% expansion pace seen in this H1 statement remains to be seen. Interestingly, the group’s seasoned managers look to have ‘upgraded’ their full-year outlook — they were previously “cautiously optimistic” but are now simply “optimistic”. The executives here are about as conservative as they come, so perhaps there is the possibility a superior growth rate can be maintained. Finally, TFW’s dividend policy remains as tight-fisted as ever. Although this interim payout was lifted 12.5%, the trailing 4.2p per share payout is a sizeable three times covered by my earnings guess — and a hefty nine times covered by the cash and investment hoard. The yield at 320p is 1.3%. Mr Andrew Thorpe will step down as Executive Chairman and Joint Chief Executive and take up a role as an Executive Director on a part-time basis. The position of Chairman and Joint Chief Executive will be assumed by Mr Mike Allcock, currently Joint Chief Executive and Managing Director of Thorlux Lighting, the largest company within the Group. Mike has been responsible for driving the growth at Thorlux for a number of years and will continue this role as well as influencing product development and the adoption of new product technology across the Group. Mr Craig Muncaster will become Joint Chief Executive whilst retaining the position of Group Financial Director. Craig has been with the Group for over seven years and has recently led the successful delivery of the acquisition strategy including the notable success of integrating both the Portland and Lightronics businesses in recent years. Mr James Thorpe will become an Executive Director of the Group and Business Development Director of Thorlux Lighting. James has been with the Group since 2013 in the role of Business Development Manager for Thorlux and has been responsible for securing a number of high profile projects which have contributed to the growth of revenue derived from the healthcare sector. “There comes a time! The salmon, bass and the 18th beckon and deserve a little more of my attention. I have enjoyed every moment of my time at F W Thorpe Plc and hope to contribute more yet even from my lower standing! The new board structure will be available on our website later today. James Edward Thorpe, aged 40, holds 1,371,450 ordinary shares in the Company. There is no further information to be disclosed under schedule 2(g) and Rule 17 of the AIM Rules in respect of James Thorpe’s appointment as a Director of the Company. Andrew Thorpe turns 68 this month, is the grandson of TFW founder Fred Thorpe and his annual-report bio suggests he has worked at TFW all of his life. Mr Thorpe was appointed as joint chief exec in 2000 and executive chairman in 2003. TFW’s progress since 2003 — operating profit has jumped from less than £4m to £16m — suggests he has led the business well. I admit Mr Thorpe’s effective retirement is disappointing, but as handovers go, this one is not too bad. Mike Allcock has been a board director since 2000, has led TFW’s main division since 2003 and has been joint chief exec since 2010. He therefore should accept a fair bit of credit for TFW’s wider group performance. Mr Allcock turns 50 later this year, so his retirement may not be in the near future. All told, Mr Allcock seems to be a safe pair of hands to take the business forward. It is interesting that James Thorpe now becomes a main board director. I think he may be Andrew Thorpe’s nephew, but I could easily be wrong. James Thorpe must be a family member with nearly 1.4 million shares. I wonder what James Thorpe was doing before he joined TFW in 2013. Finally, Andrew Thorpe refers to salmon and bass, and I now understand why TFW carries ‘fishing rights’ as an intangible asset (the business owns a property by the river Wye).